In an attempt to keep local teens safe behind wheel, AAA partnered with SAFE Delaware County to hold a teen driver safety event at Olentangy Orange High School on Friday. Students were able to have their cars checked for possible safety issues, sign a pledge to Slow Down!, and drive a distracted driving simulator. 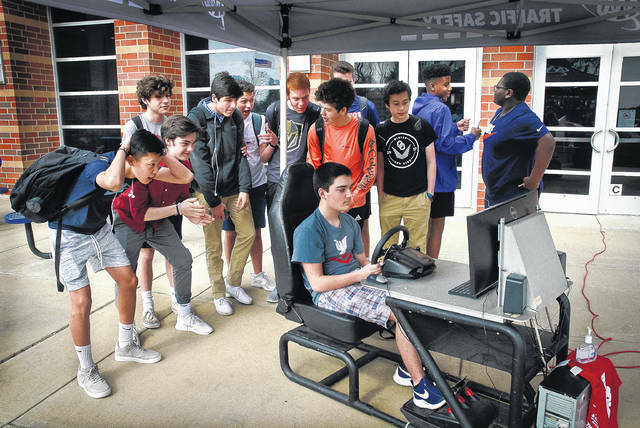 As Gabriel Habel, pictured, took the wheel of the simulator, many of his friends stood behind him offering advice on how to handle the surprising situations as they popped up. This entry was tagged AAA, D. Anthony Botkin, Driving, Olentengy Orange, SAFE. Bookmark the permalink.